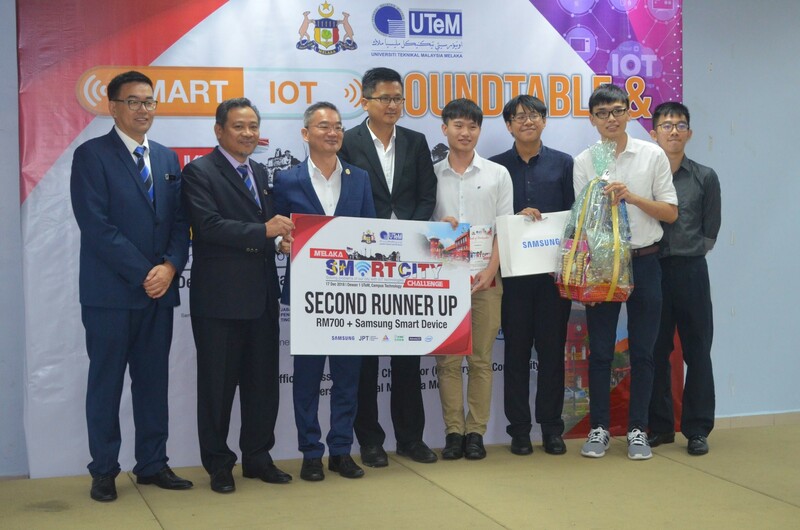 A team from Faculty of Information Science and Technology (FIST) named Vanguard won second runner-up at Melaka Smart City Challenge recently. 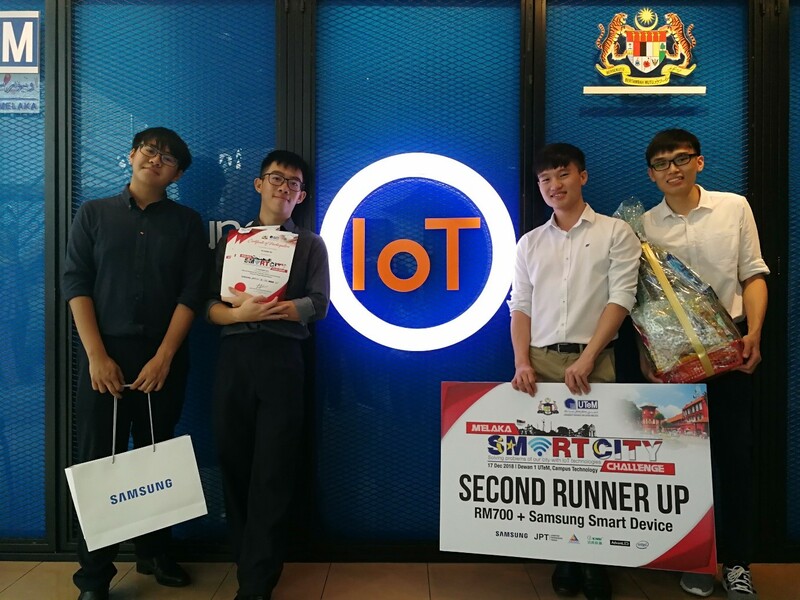 The competition was organised by Universiti Teknikal Malaysia Melaka (UTeM) and sponsored by Samsung. 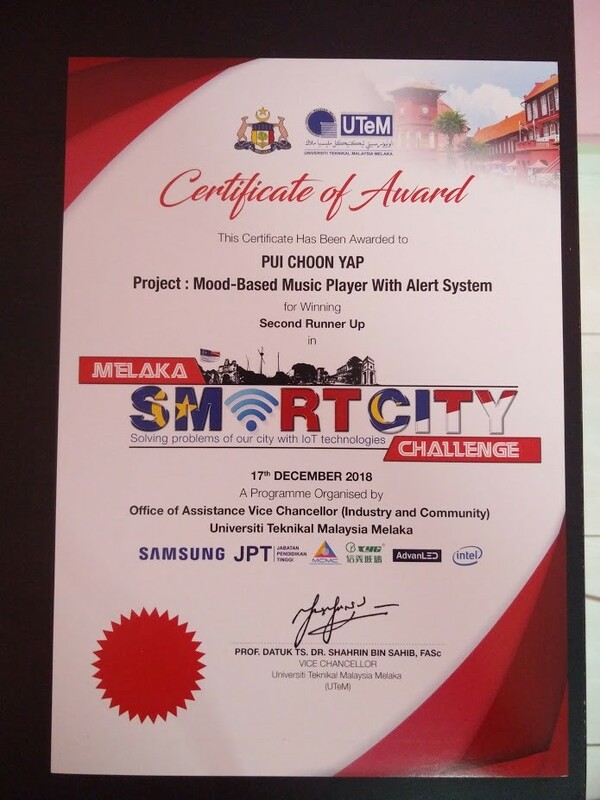 Pui Choon Yap, Foong Ee Fong, Henry Lim Herng Yih and Long Zhi Leng participated with their project entitled ‘Mood-Based Music Player with Alert System’, and they were supervised by Dr. Tee Connie. The project develops an IoT device which is attached to the dashboard of a car to perform mood recognition as well as drowsiness detection. A mobile application is implemented to play music based on the user’s mood. The mood of the user is detected by the facial expression of the user. Besides, a drowsiness alert will be raised if drowsiness is detected. A drowsiness notification will also be sent to nearby drivers to warn them about the existence of a drowsy driver near them. A total of fifteen teams had been selected as the Top 15 of the competition. An IoT Bootcamp by industry partners was conducted to host the Top 15 finalists in a workshop to further improve their prototypes as a value-added for participants. During the competition, the participants had to pitch to the judges, followed by a brief Q&A session. The judges evaluated presentations on relevancy, economic/social/environmental benefits, technical, and innovation of the projects. Only five teams made it to the Grand Finals and the MMU team emerged as the second runner-up.